This article was written on 09 Mar 2012, and is filled under Featured, News. To celebrate Black History Month, The Law Offices of Jeffery M. Leving is sharing the stories of caring black fathers who are making LIVING HISTORY by turning the tide against our national crisis of father absence. While Our Black Heritage is a site devoted to historical documents, our affiliation with the Fatherhood Educational Institute and President Obama has incited us to take a look at the important trends occurring in African-American history AS IT HAPPENS TODAY. Principal among these, from our point of view, is the fight to establish numerous responsible and loving black male role models in African-American communities so that children have father figures that they can look up to. The first story of a caring black father we would like to share is that of our very own Todd Cole, who was recently chosen by the legendary newspaper, The Chicago Defender, as a 2013 “Man of Excellence.” Please read Todd’s story below. 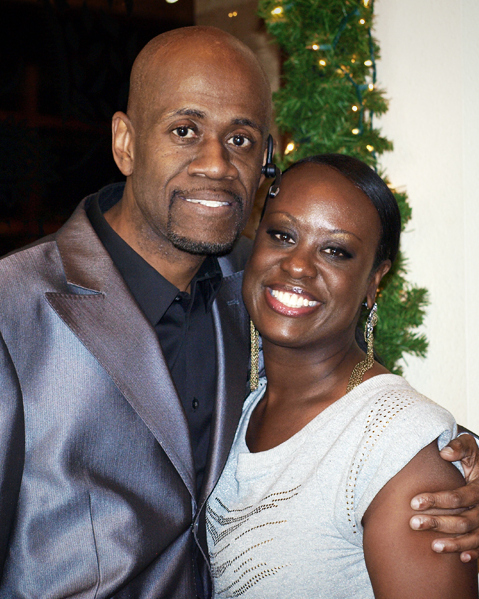 Todd Cole with his wife, Dione Cole. Todd Cole has been working with numbers for as long as he can remember. The youngest of eight children, Cole grew up on Chicago’s West Side during in the 1970s. He spent every spare minute of his teen years doing bookkeeping and other tasks at his father’s business, a private parking lot in the Chicago Loop. After graduating from Crane High School, Mr. Cole transferred the bookkeeping skills he learned at his father’s business to a career in the legal industry, becoming an outstanding account specialist at the Law Offices of Jeffery M. Leving. On a daily basis, he tracks the legal cases of fathers seeking child custody as they move through the legal system, and listens to their questions and concerns. A consistent caretaker for his sons throughout their childhood, Mr. Cole today brings the lessons he has learned about childrearing and child custody to meetings at the Fatherhood Educational Institute (www.fatherhood-edu.org), where he discusses with other fathers the importance of male role models and how to improve relationships between children and fathers. He gives advice to men who are facing child custody struggles, and he enjoys helping a diverse group of men to survive and thrive while fighting for their children. As someone who has been through these struggles himself, he is seen as a trustworthy resource by other men. Today, Mr. Cole’s own sons, aged 14 and 17, hold 3.5 and 3.7 grade averages, respectively. His eldest son attends Simeon Career Academy in the Chatham neighborhood and is being considered for a scholarship to the University of Southern California. His younger son attends a Perspectives Charter School. Cole and his wife Dione are strict with them about school work, requiring them to complete their homework and have it checked every night after they finish their chores. *To share YOUR story of a caring black father, e-mail a profile of 300 to 1,800 words, along with 1-2 digital photographs, to Jennifer Whiteside at info@ourblackheritage.com, or dial (312) 407-6843.